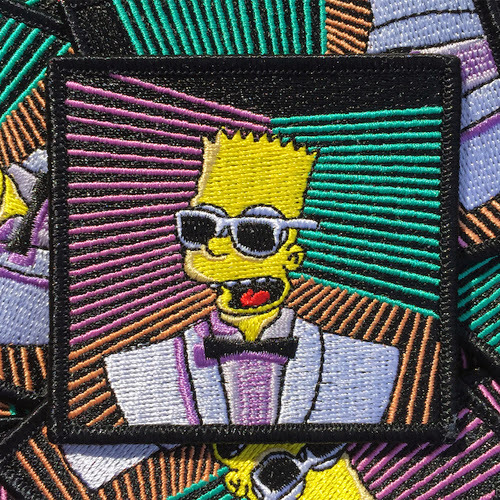 The latest series of patches on offer depict simpsonized versions of punk band logos, including Amebix, Screeching Weasel and the Descendents. A street performing magician strives to impress the passing crowds with his lackluster trick of producing a dove from his top hat. When he finally gives up something surprising and truly magical happens! "Something we have all no doubt noticed is the increasing fixation with what is going on our smartphones - if it's not ourselves, then we regularly see other people walking down the street pre-occupied with their phones, we see buses and trains full of commuters fixated on their little screens desperate for some information fix and it’s not uncommon to see friends in restaurants interacting with their phones rather than each other - all missing what is going on around them and reducing their quality of life as a result." 'Planet Under Pressure' is the second film Moth Collective has produced for the Global Canopy Programme, a tropical forest think tank working to demonstrate the scientific, political and business case for safeguarding tropical forests as natural capital. "Larger and richer populations are increasing the pressure on natural resources, further exacerbated by the immediate problem of a changing climate, with serious impacts on water, energy, and food security. The close interdependencies between water, energy and food are multiplying these threats in diverse countries and regions demonstrating that climate security will be an issue for all. An integrated 'nexus approach' is helping decision-makers to manage shared resources and achieve truly sustainable development." Brazilian animator Antonio Vicentini has taken a bizarre uncredited audio recording, lifted from the "spoken word" Bhutanese Passport entry on Wikipedia, and applied it to a hilarious exercise in simple animation and lip synchronization! In 'Cheval Noir' Kadavre Exquis, a French graphic designer and animator also known simply as Françoise, continues the sci-fi infused narrative seen his first music video collaboration with Equateur and their track 'The Lava'. Graphic designer and illustrator Jurian Möller has released an animation condensing 550 million years of human evolution into a minute long walk-cycle. Clicking the link leads you down a wormhole of previously unreleased shorts featuring OReilly's archetypal aesthetic and classic black humor. The shorts are wonderfully packaged and presented in a multi-verse tied together with a looping pseudo-sci-fi narrative about a machine left alone for billions of years contemplating its own creation and existence. 'Forgot' is a short film about memory, emigration, longing, Jesus kitsch, cocktail sausages and children’s television. 'Forgot' explores the shape of memory, telling the story of a life through its effacing. A non-linear narrative that flashes between childhood and maturity, as it all slips away... From what we long to remember, to what we'd sooner forget. Animator Stefano Meazza and illustrator Mauro Gatti animated this characterful spot illustrating the emotive effect of different musical genres. "Music has the ability to arouse a myriad of emotions, so be careful the next time you’re skipping between radio stations!" Jessica Ashman's superb 2011 Scottish BAFTA and New Talent BAFTA award winning stop-motion short film 'Fixing Luka' is finally online. Inspired by Jessica's own experiences growing-up with a younger brother with autism, 'Fixing Luka' is a touching tale of hope, determination and acceptance. "In a ramshackle cottage beside a forest, Lucy and Luka live with their parents. Every day, Luka drives his sister mad as he happily performs obsessive, nonsensical routines with sugar cubes and thimbles. Watching his antics, Lucy thinks her brother is broken but when she’s given the chance to fix him, will she take it?" 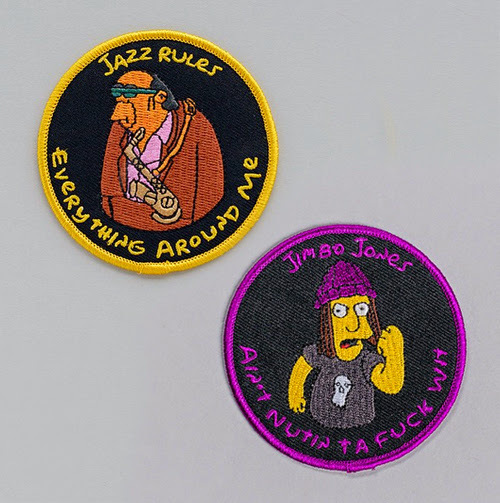 Simpsons-themed sew-on patches are being brought to our attention on an almost daily basis, so we thought we'd post a collection of our current favorites. 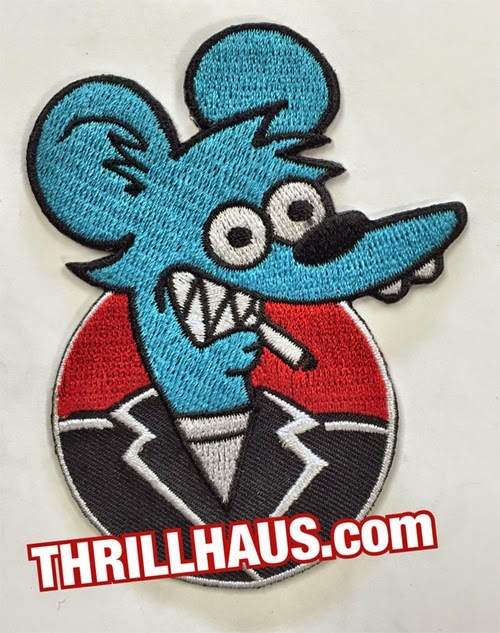 Get sewing... You're denim jacket will have never looked so rad! Eric Dyer, artist, filmmaker, experimental animator, and educator, loves pioneering interesting and unique zoetropic projects. 'Copenhagen Cycles Journey (Midnight Moment)' features 25 zoetrope-like paper sculptures, comprised of a photo-collaged reconstruction of a cyclists travels through a fantastical interpretation of Denmark's capital city. In a more recent project, dubbed 'Baldwin Geotrope', Eric experiments with an 80ft wide simple phenakistoscope image etched into a field and filmed from a rapidly rotating drone. A quick scan of Dyer's website also hints at tests with a hot air balloon and an ambitious zoetrope tunnel in which to immerse viewers... Interesting stuff! Karolina Glusiec has applied her archetypal , simple yet inventive, pencil-on-paper illustrative style to a new music video for polish "freak-electronic" group JAAA! The animation accompanies the track 'Spook', taken from JAAA! 's forthcoming, as yet untitled, debut album. The latest animated project from digital visual artist KWGT turns a Tumblr into a user controlled interactive animation medium. An anime-style girl changes appearance just as quickly as she walks through the surrounding trippy, morphing landscape. The speed of the animation and the resulting transmutations are dictated by the viewers use of the scroll wheel. Visit the site to try it for yourself (yukisusumisariyuki.tumblr.com) or watch the sample video embedded below. The Animated Review and our cohorts at Henry Press have combined our two great loves into one spectacular collaborative print. 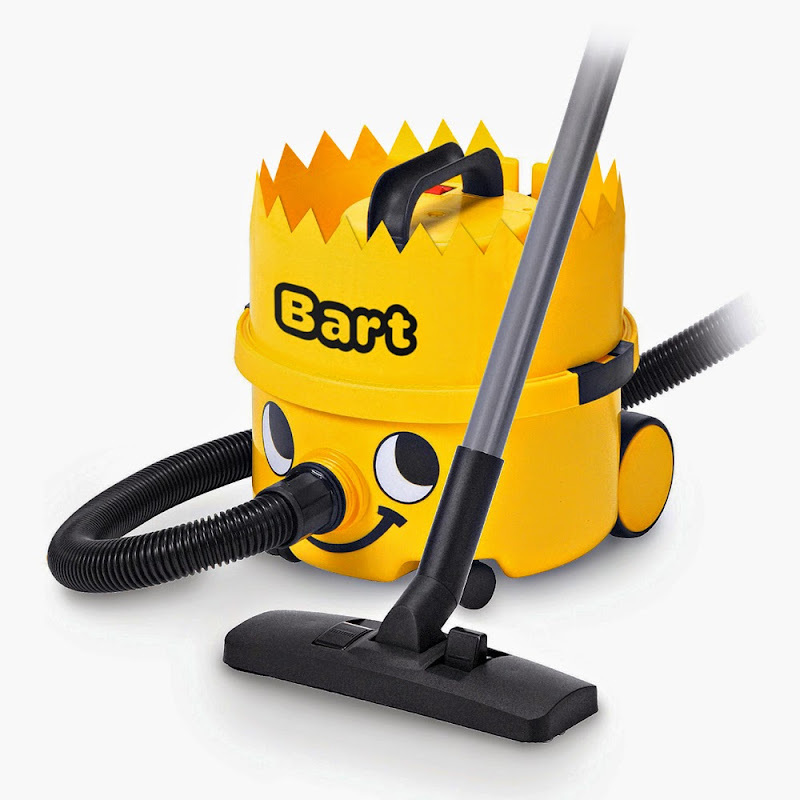 Bart Simpson and Henry Hoover have been amalgamated into our dream Numatic cleaning product, the... Bart Hoover! Belfast-based illustrator and animator Ashling Lindsay animated this suitably arresting snowy music video to accompany the hauntingly beautiful harmonization of singers Peter McVeigh and Ciara O'Neill, and their track 'Song for Winter'. Emmanuelle Walker animated this gorgeous avian promo for the upcoming book 'Beautiful Birds', illustrated by Emmanuelle Walker, written by Jean Roussen and published by Flying Eye Books. 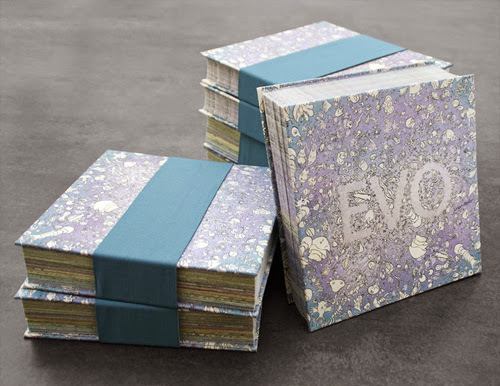 Pre-order the book from Flying Eye Books on flyingeyebooks.com, out in March 2015! 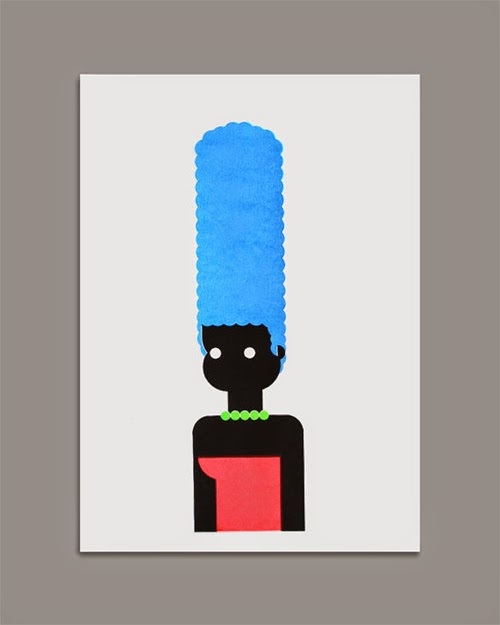 Aaron Craig is an Australian graphic designer from Newcastle with a background in fine art and photography. His work is primarily comprised of graphic design elements, photography and fine art in his heavily detailed and layered collage style, drenched in vibrant colours, 80s pop-culture and curvaceous women. 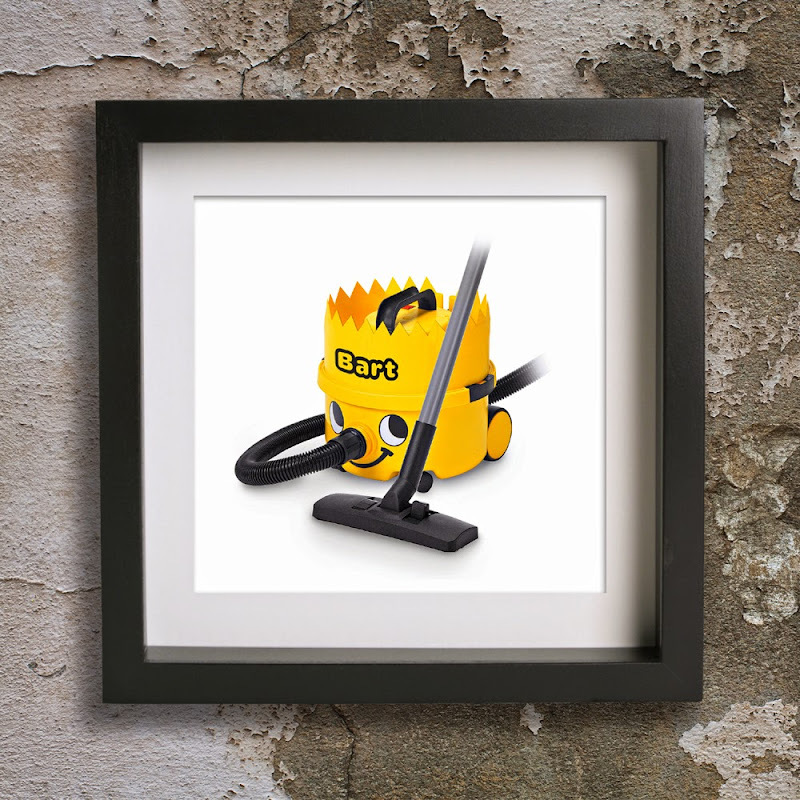 The A3, archival colourfast ink digital prints, are limited to a tiny edition size of just 10 copies, all signed and numbered by the artist. Pick up a copy via the Stupid Krap online store whilst you still can. Digital Kitchen Studios teamed up with FXX to create the main title sequence for the network’s new original comedy 'Man Seeking Woman,' starring Jay Baruchel and created by former 'SNL' writer Simon Rich. Based on Rich's book of short stories, 'The Last Girlfriend on Earth,' the series is a sweet and absurdist look at the surreal life-and-death stakes of dating and the quest for love —centered on Josh Greenberg (Baruchel). DK crafted an iconic graphic approach for the titles, meant to contrast with the show’s live action. In the sequence, symbols of ordinary dating life mix with over-the-top, genre-spanning imagery, reflecting the unique narrative device used in the series. Packed into 30 seconds, the titles are filled with action and fun moments to keep each viewing fresh and engaging. Viewers are sure to catch new details each time they watch. Titouan Bordeau's 2nd year student film from La Poudrière, made in 2013 but only recently released online, sees a lonely space traveler growing tired of him mission and visiting planet after planet. When he happens upon a habitable world populated by little green ducks he decides to stay, sending an inquisitive native on in his place. The California Sunday Magazine approached Brian Rea & Pablo Delcan to participate to their 'California Inspires Me' project, a series of animated interviews on Californian artists sponsored by Google Play. This time, director Mike Mills reflects on his creative journey and speaks on his influences. 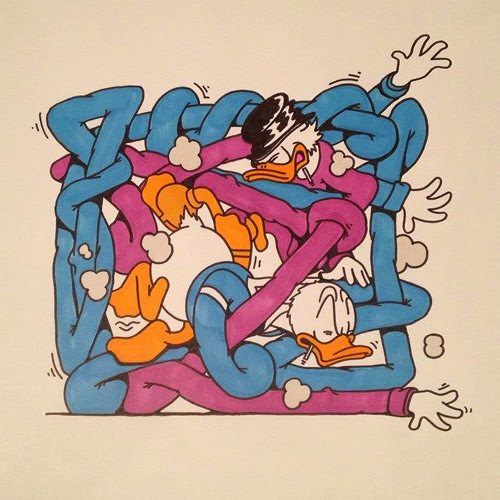 Vince is perhaps best known for the hallucinatory animated shorts he made in the 1970s and 80s that featured his deeply-saturated, perpetually moving and morphing figures. Most notably 'Malice In Wonderland'... a warped and sexually explicit adaptation of Lewis Carroll's classic children's book. Vince has also often worked with a retrospective aesthetic; making 60s-style films in the 70s and so on, so it's not surprising that his most recent body of work resembles the clunkiest 90s CGI animation you can imagine. It's great to see this kind of surreal 3-D experimentation when perfect reality is so sought after by many aspiring animators. John Edmark is a designer, sculptor, artist, inventor, and by necessity a mathematician, who lectures in the design program of the Department of Art & Art History, at Stanford University. He is currently the artist in residence at Autodesk's Pier 9 Artist In Residence (AIR) Program. His latest project is a series of 3-D printed sculptures designed to animate when spun under a strobe light. Like much of John's work their design is closely informed by Fibonacci sequencing, the golden spiral and the instances these are encountered in nature. Some of the resulting sculptures although derived mathematically and manufactured through a process of computer aided design and 3-D printing couldn't look more natural when captured in motion. Some give the impression of eternally blooming flowers or pulsating plant spores... Beautiful! Canadian illustrator and animator Jonathan Robert animated this extraordinarily good promo for the new self-titled album from Corridor. Set to the track 'Castor & Pollux' the video unsurprisingly features twins, but rather unusually sees them rhythmically bashing the head of a bizarre green-skinned pig-nosed character. Beyond the twins appearance the accompanying visuals are completely disconnected from the Castor & Pollux known from Greek and Roman mythology... We certainly can't remember the appearance of a cocaine snorting walrus in any of Homer's epic poetry!? Matt Reynolds wrote, directed and animated 'Bottom Feeders' as a first year film project on the MFA experimental animation program at Calarts. "Divided by a barrier of fog, two disparate species fight to adapt and survive in a deliciously unsympathetic world." 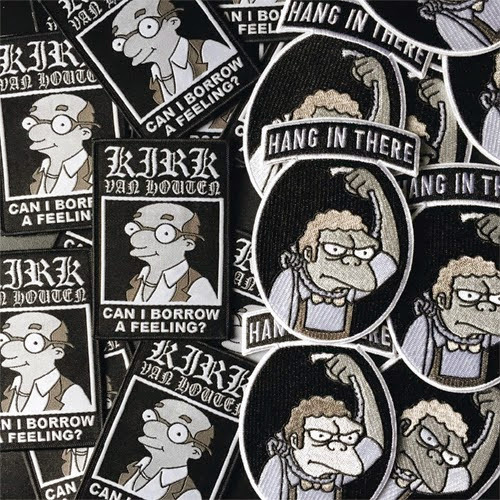 Mike McCabe has released a pair of Simpsons iron-on patches celebrating two of the shows most iconic deadbeat characters... suicidal Moe Szyslak and depressed divorcee Kirk Van Houten. 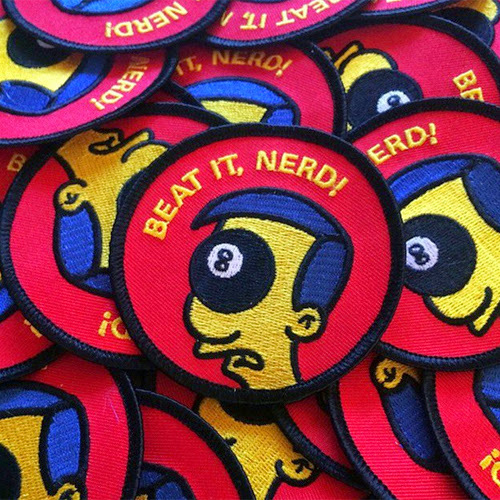 The patches are priced £6.00 each or you save yourself a few quid and cop the pair for a reduced price of £10.00! 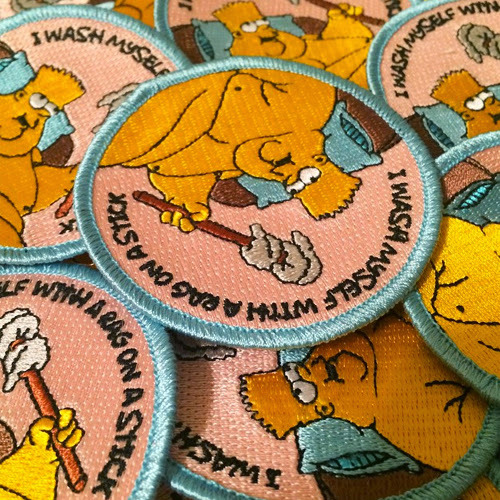 The initial batch were snapped up in a couple of days, but more are on their way and can be still ordered via Mike's online store. 'Black Mass', the latest print from Bob 2, sees Snoopy sleeping on a sacrificial alter, completely at the mercy of a naked lady wielding a knife... Perhaps she represents Twentieth Century Fox Animation & Blue Sky Studio and their intended treatment of poor old Snoopy in the CGI adaption of the Peanuts gang!? 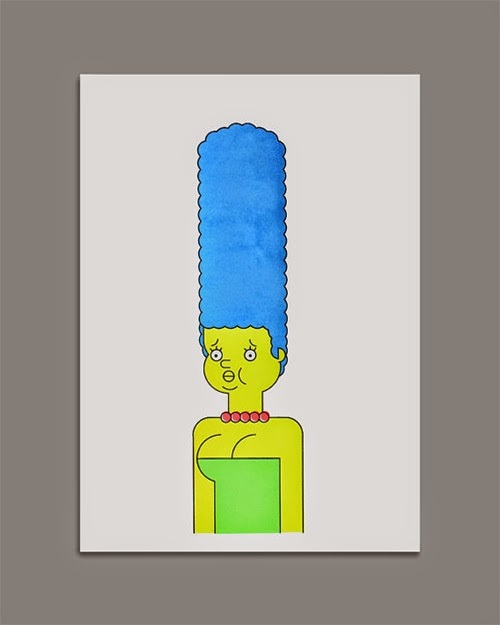 The print is limited to a signed and number edition of just 20 copies, and available now via the Works Of Bob online store for just £45 plus shipping! NB: We happen to think the 'Peanuts' movie actually looks pretty good! Puppetry and marionette manipulation share many of the qualities achieved in animation through giving life to inanimate performing objects. Likewise puppeteers often assume the multi-facet creative roles of puppet-maker, director, designer, writer and performer, a variety of roles also assumed by the independent animator. 'DIS \ CONNECT', Doug Hindson's graduation film from the Illustration & Animation course at Kingston University, was all shot "live-action" with the hand-made puppets manipulated through strings and controlling rods all captured in-camera. The charmingly stylised wooden figures, captured in all their clunky glory, alongside the obvious in-shot production techniques harks back to a simpler time in TV entertainment and resonate perfectly with the films protagonist and his dissatisfaction with technologically driven digital age in which we live. "A search for higher meaning, dissatisfaction with the status quo and a sense that you’re the first person to feel this way. You're not!" 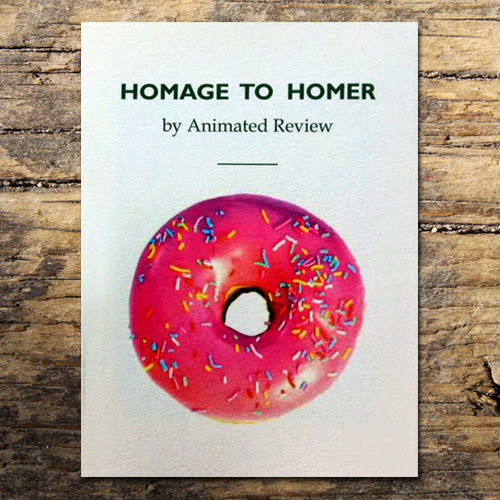 We're pleased to announce the online release of 'Homage To Homer', our newest zine produced in collaboration with Henry Press. 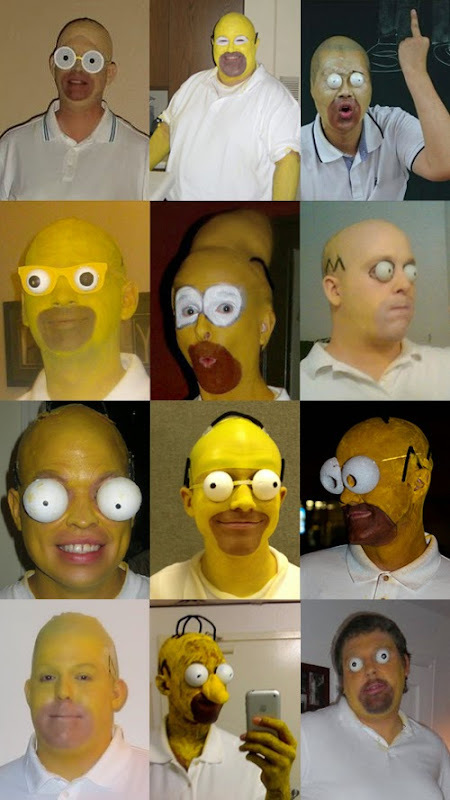 This latest publication collates a horrifying costume tribute to Homer Simpson.... 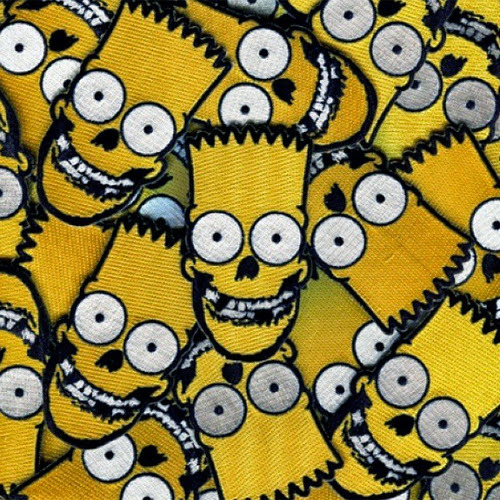 Behold a variety of fanboys paying homage to this iconic Simpsons character festooned with bald caps, ping pong ball eyes and excessive amounts of yellow body paint! The majority of the 50 copy print run have already sold through a month long period of exclusivity with Magma Books in Manchester. 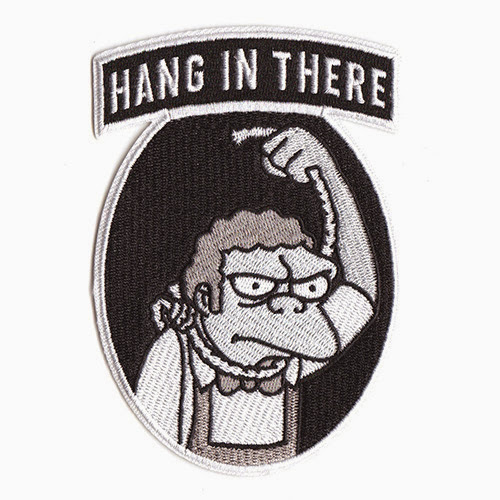 The remaining stock has now been distributed between Magma, Lik+Neon and both the Animated Review & Henry Press online stores. Grab a copy whilst you still can! ‘Way out’, Yukai Du's Central Saint Martins College MA Animation graduation short, is inspired by Sherry Turkle's book 'Alone Together' and a reflection of modern life in a digital age. "The exaggerated contrast between emotionless citizens and characterised phones reveals our over-dependence on virtual communication. A dramatic and extreme consequence shows a negative attitude, for which no one can escape the trend of technology that originally comes from the endless appentence of human beings." The California Sunday Magazine approached Nicolas Ménard to participate to their 'California Inspires Me' project, a series of animated interviews on Californian artists sponsored by Google Play. This time, Jack Black is covering growing up in Hermosa Beach, an early crush and Spicoli lifestyles. 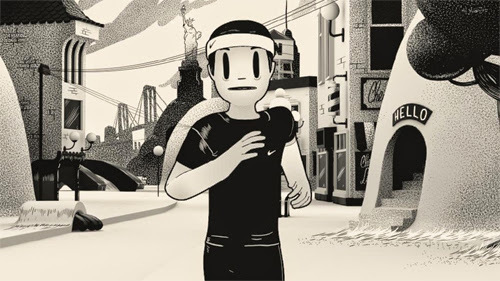 The 100,000 most active Nike+ members received a one-of-a-kind animated sequence marking the new year for 2015, with each personalised animation created using data uniquely specific to the user. Meaning a runner from Toronto would receive a completely different film from a NTC user in New York! In addition to personalising the location, there are a multitude of sequences honoring the achievements of four key cities and North America as a whole. The resulting 1500 animated clips populated a custom render cloud system, which then (influenced by the pertinent individual data) rendered and constructed the necessary 100,000 animated shorts. 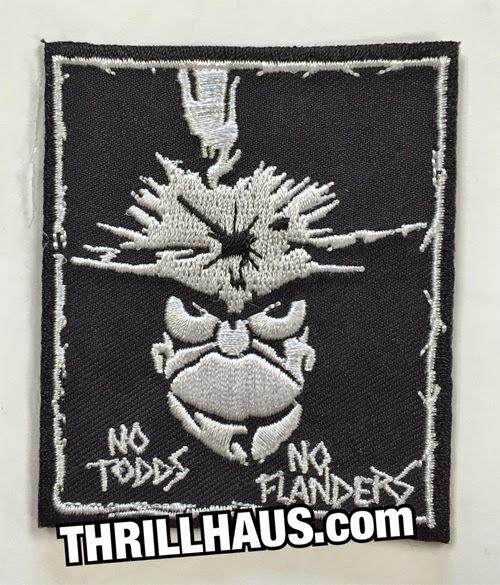 Here we've posted a general, less tailored, version of 'Outdo You', but a multiple number of various renditions can now be viewed online. This new promo from Nike, illustrator McBess and director Laurent Clermont is reminiscent of the 2010 collaboration between Nike and James Jarvis. 'Onwards' represented something of a more equal relationship between artist and brand with James' illustrative style and personal running experience remaining integral to the short. The same can be said of 'Outdo You'... As opposed to a marketing exercise the piece was commissioned as gift to Nike's 100,000 most dedicated customers. Likewise, the directorial vision of Laurent's personalised animated sequence (based on the customers location, weather, activity and individual Nike+ movement data) and Mcbess' distinctive illustrative style have prevailed. 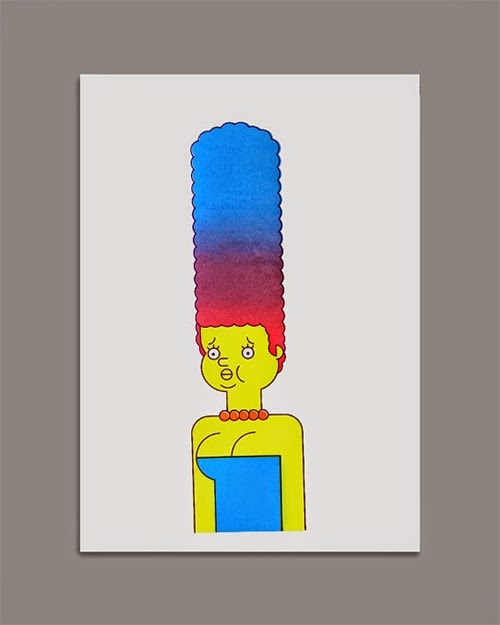 Illustrator, graphic designer and screen-printer Emile Alexander aka BloodBros created a series of one-of-a-kind Marge Simpson screen prints, each a unique experiment in strange colour combinations and slight variations. 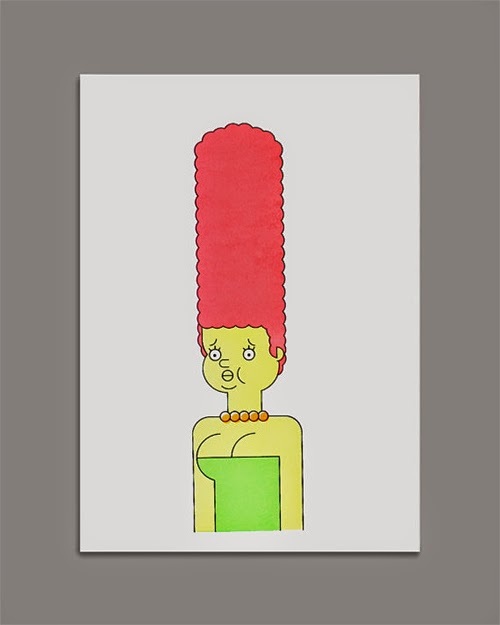 Each of these original screen printed artworks have been printed on A3 200gsm acid free paper, numbered 1/1 and signed by the artist. It's not entirely clear how many variations we're created but only a handful remain in the BloodBros Etsy store, price between £10 and £15 a piece. The animated MV to accompany Jonathan Lindley's track 'Anfetamine' captures musically synchronised lights, shapes and lines reflected in the abnormal drug-induced dilation of the pupil of an eye. It's a wonderfully simple concept perfectly executed. We love it! 'Anfetamine' is taken from the 'Venom' EP and exclusviely available via Sunbird Records. This short bittersweet animation from Paris/Brussels-based motion design network Pixileon depicts the natural beauty of the rainforest and the savageness of it's continued destruction. In this self-initiated holiday project from the all-female Wednesday Collective a traumatised cat witnesses a 'House Party' descend into wild debauchery! Los Angeles-based animator, video artist and director Johnny Woods specialises in hyper-real and disturbing CGI animation. He has directed a multitude of music videos exploring the "uncanny valley" - a term coined by robotics professor Masahiro Mori in describing the discomfort in viewing something that looks, but not exactly like a natural being. This latest music video for Duran Duran Duran track 'Rejectro' (taken for the Tigerbeat6 released 'Rejectro' EP) sees a naked dancer who's body undulated and distorts as she rhythmically gyrates to the music. It's equally mesmeric and disturbingly odd. 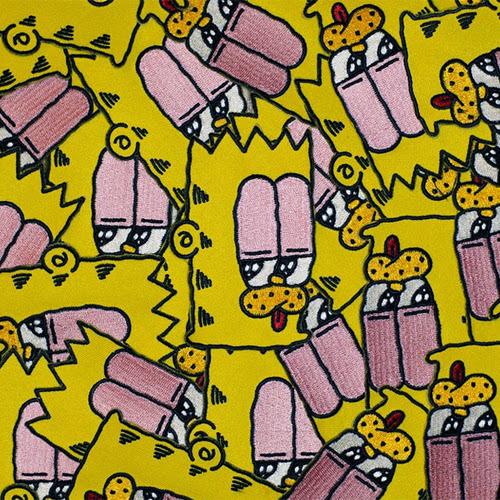 Paris-based artist and graffiti writer Ermsy has published a 52 page 'zine titled 'Say No To Soft Drugs'. 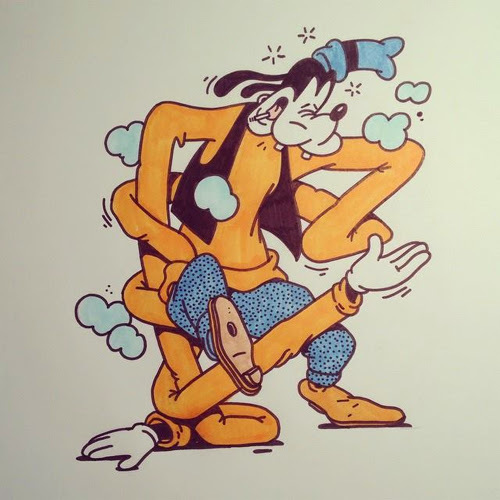 The booklet compiles a series of stoned out illustrations featuring Mickey Mouse, Garfield, Pink Panther and other great cartoon icons. 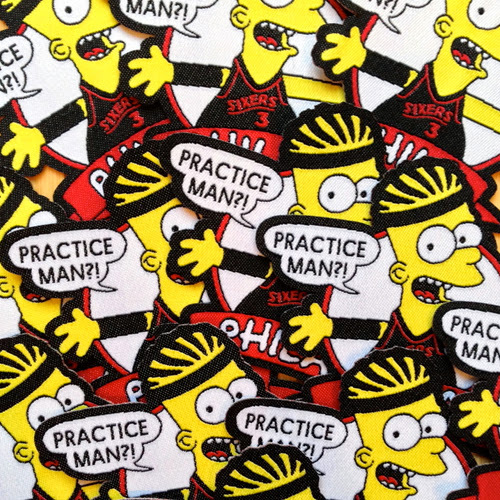 The 'zine has been released via Ermsey's Adihash Big Cartel store in a limited run of 50 signed copies, priced £10. 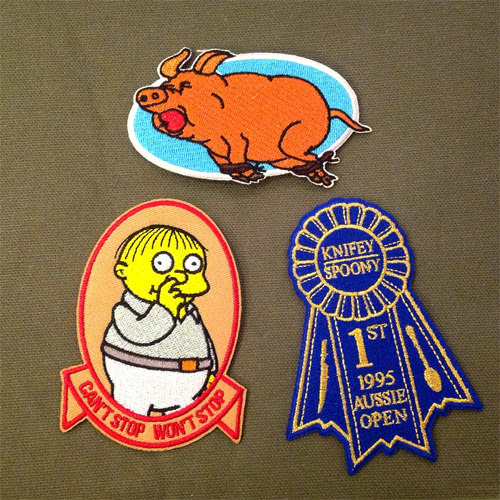 It also includes 4 high quality die-cut stickers sealed in their own ziplock bag and a folded A4 poster print. 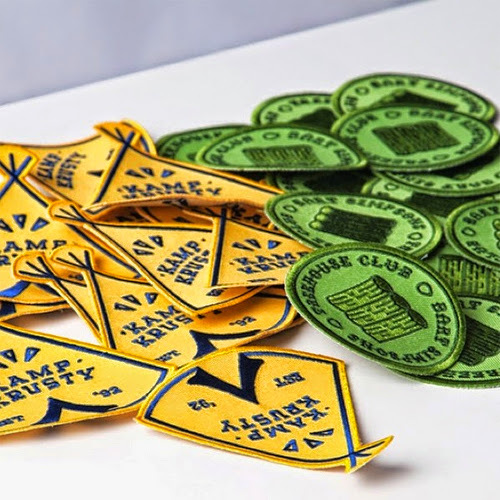 Grab one whilst you still can! Spotted via of blogging friends Streets Of Beige. This "sweetly" animated stop motion advert for the credit card issuer MICARD, and their new campaign exchanging points for rewards, was composed with the traditional Japanese hard candy Kintarō Ame. Typically Kintarō candy depicts the folkloric character of the same name, in this spot the sweets depict the singing face of Shugo Tokumaru and a variety of exciting purchases like an engagement ring, bow ties and carrots! The gorgeous illustrative paintings by Chinese artist Oamul Lu have been elegantly transformed into a variety of animated GIFs, promotional shorts for his published work, and other commercial projects... Including this sweet new spot for Converse. The Tokyo Designers Week is a cultural festival held annually at Meiji-Jingu Gaien Mae (in front of the Meiji Memorial Picture Gallery) celebrating contemporary design, art, music and fashion. Part of the 2014 event, subtitled the Genius Expo, showcased a variety of "geniuses", experts in their field, including this superlative animated collaboration between pre-eminent Japanese independent animator Mirai Mizue and musician Takashi Watanabe. "Playtime ends at the five o'clock chime.... then comes the indefinable time between vanishing playtime and dinner time at home." This advert for Japanese coffee brand Maxim and their instant latte sticks features an animated love story, crafted from a thousand uniquely stenciled cups of latte. "The world's first latte art animation (latte-motion) created with 1,000 cups of latte!! Please enjoy the rich, creamy story connected by carefully handcrafted latte art one by one."